This entry was posted on December 21, 2007 at 5:52 pm	and is filed under 3D Graphics. You can follow any responses to this entry through the RSS 2.0 feed. You can leave a response, or trackback from your own site. 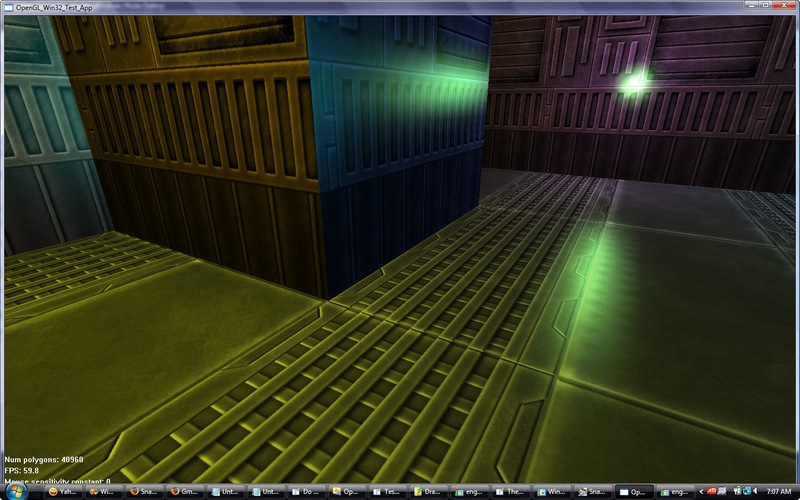 Specular lighting is, by definition, view angle dependent. “View angle dependent” means that the lighting should appear differently depending on the angle between the viewer and the surface. Your article makes it sound as if specular reflections on objects shouldn’t move as the eye position or angle changes. That is incorrect. Put a shiny object on your desk and rotate your head left and right. You’ll note, the position of the highlights change as you rotate your head. Real-world reflections are view-angle dependent. It is this effect that GL is trying to emulate with the specular term. I’m currently implementing a fisheye camera for Blender Game Engine, and I couldn’t get the specular light to match each individual render (to make a fisheye I’m rendering the scene 4 times each frame). Blender Game Engine code is very old. So we still have old bugs as this. By now this is an even older post, but I felt like disagreeing with the first comment anyway. Specular differs depending on the angle between 3 points: the camera, surface and light locations. There is no camera angle/rotation needed to compute that, only the camera _location_. That’s obvious if you consider that the same light rays will still arrive at the same location even if the you rotate the object receiving them. Also, rotating your head is not really the most reliable way to verify this in the real world. For nearby objects you would have to close one eye and rotate around the center of the other eye to keep the eye location fixed, not an easy exercise :). For far away objects it works better of course. Hi, I think I’m quite possibly being a bit thick, but I can’t see why you’re confused about OpenGL’s way of doing things. Specular lighting is determined by the vector from the viewer to the surface, the vector from the surface to the light source and the normal on the surface. 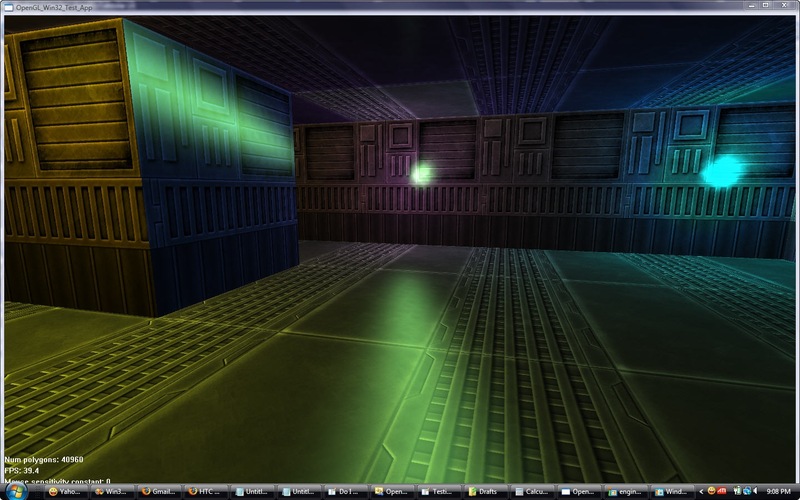 In OpenGL you effectively transform everything so that the notional camera is fixed and the world moves around it. Using the OpenGL matrix stack you can maintain various different objects with different bases, such as a static tree and, separately, a car that drives around it. With that in mind, stating that the light is at (x, y, z) when drawing the tree means a different thing than stating that it is at (x, y, z) when drawing the car, because they have different positions and orientations. If OpenGL were to reverse transform the light position into world space when drawing each object, then where should it transform back to on the matrix stack? And what if you want to be able to specify a light that is moving with an object, do you have to transform its position yourself? The only meaningful solution is to have the light somehow capture how the information in the matrix at the top of the stack when it is specified. Which is exactly what it does, and clearly exactly the point you’re making in this post. But what could the alternative be? What frame of reference should OpenGL use when you specify a light position? And why should you have to implement your own transform if you want a moving light? It’s very possible that I’m completely missing the point though. Hi, another thought in that matter. I’m strongly tempted to think that not only specular, but there is no reflection effect that should be “View angle dependent” in real world. 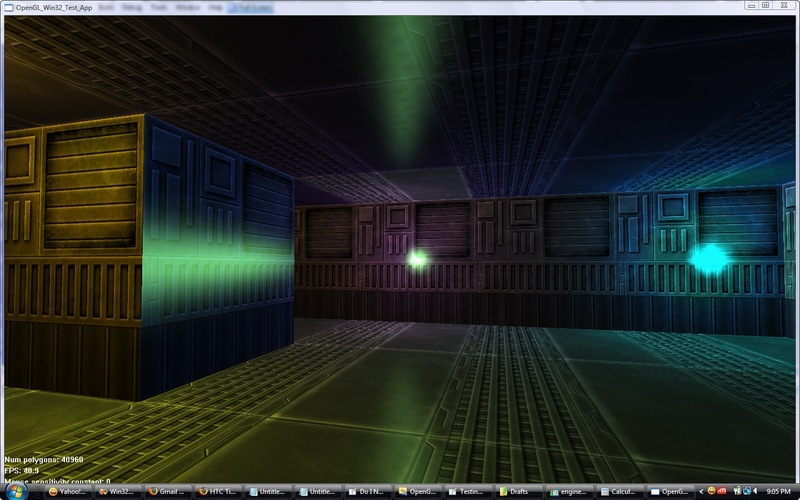 I even ran some tests with raytracing softwares. Even if I rotate the camera the mapped result is always the same. However, I see all around the net tutorials to implement Spherical Environment Mapping or Cube Environment Mapping which result in “View angle dependent” results. 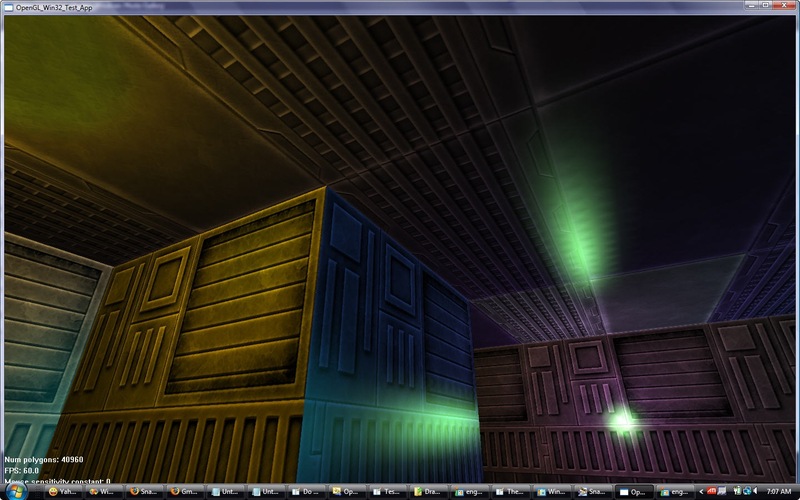 On top of that I managed to get a cube map reflection GLSL code working already (no view dependent). 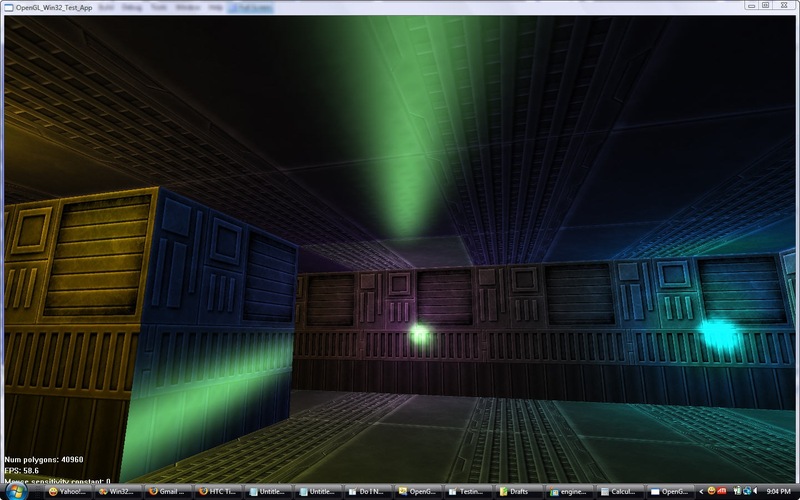 However I still need to do the same to Spherical Envionment Mapping code (both openGL and GLSL). Should they be “View angle Dependent” or not? Dalai – if you’re rendering objects based on how it would look to a single point-source camera, then specular and/or reflection effects do not depend on the camera’s viewing angle. The reason so many people think it is view angle dependent is because of what we see as human beings in the real world. Take any reflective object (like the back of a DVD for example), hold it in your hand and now rotate your head while keeping your eyes focused on the reflection. What is reflected does shift a little bit as you move your head back and forth. The reason that the reflection shifts is because your eyes are in the front of your head and not in the center of your neck (i.e. they don’t sit exactly on the axis of rotation) – so when the head rotates around the neck in 3D space, the eyeballs are not only rotated but also moved to different (x,y) or (x,z) positions by a small amount. Since your human “camera” (eyeballs) is being shifted to different positions in 3D space, the reflection must shift also. It is this often overlooked fact that’s making reflections/specular effects seem view angle dependent. Thanks this was the problem I was having and thanks for explaining why is is happening rather than just, use this code.